Apply butter, jam, mayonnaise, avocado and other spreads to bread with the Winco TN713 Sandwich Spreader with Wooden Handle. 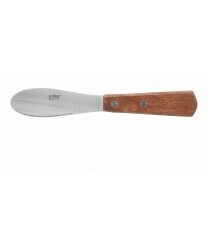 This unique sandwich knife has a comfortable wooden handle with two metal rivets to increase stability and durability. The sandwich spreader knife has a rounded stainless steel blade with an attractive satin finish. The smooth rust-resistant blade is partially serrated, so you can cut your delectable sandwiches into sections before serving.